We had a successful week of Tot School! Ethan really loved each of the activities, which was nice. I haven't moved on to any specific theme yet. 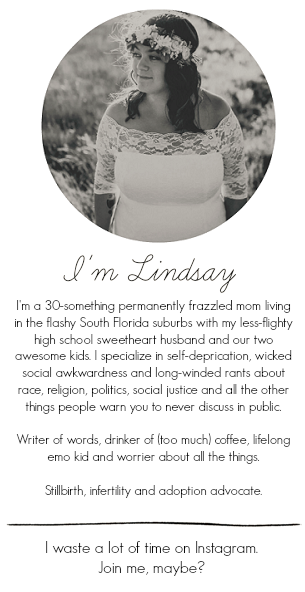 We're still just working on colors and color matching. 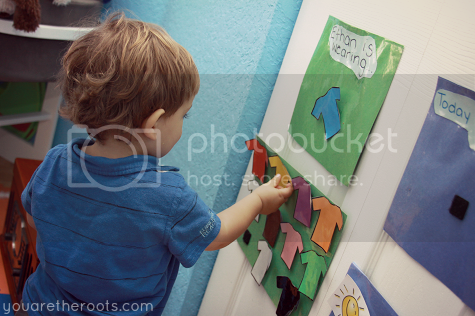 Though we did spend a great deal of time in Tot School this week, Ethan's main focus was on reading. He's always loved books but this past week I've noticed his love for reading truly blossom. I absolutely love it and have been encouraging him to keep selecting stories from his bookshelf as his little heart desires! 1. 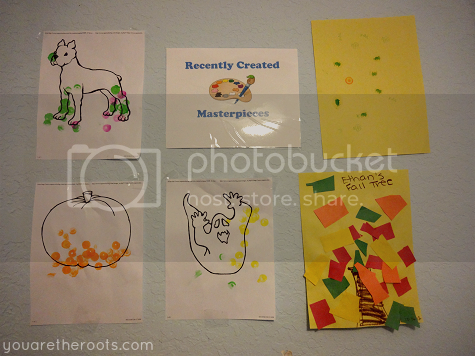 Dog & Bone Color Matching Activity - I found a pretty decent sized shoebox belonging to my sister and recycled it into a fun Tot School activity. Covering the top in white paper to not confuse Ethan, I attached bones in varying colors and cut little slits in them. 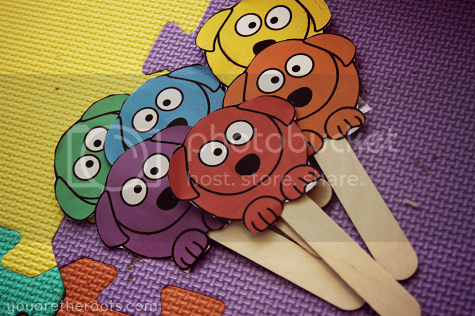 I then printed out dogs in corresponding colors and attached them to popsicle sticks. 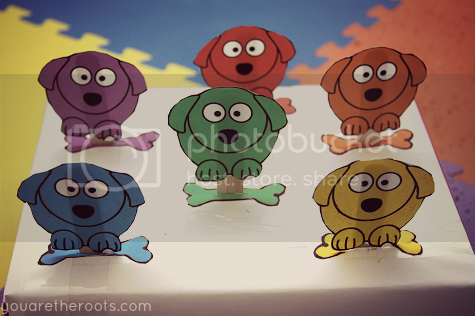 The point of this was to match each dog with the corresponding bone. Ethan loved this activity to the point where he'd just carry the dogs around with him everywhere. 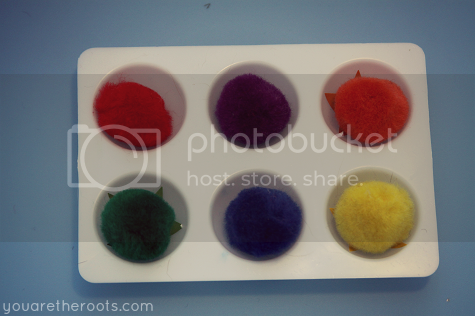 He had a little bit of difficulty fitting them into the slots at first but once he figured it out, he loved just sticking any colored dog into any colored slot. Once he was really sitting and I helped him compare the colors he would get the hang of it, but nothing beat the thrill of putting the dogs in the slots. 2. Family Tree Color Matching - I grabbed the family tree color matching idea from Nicole, only hers was way prettier and less spastic. 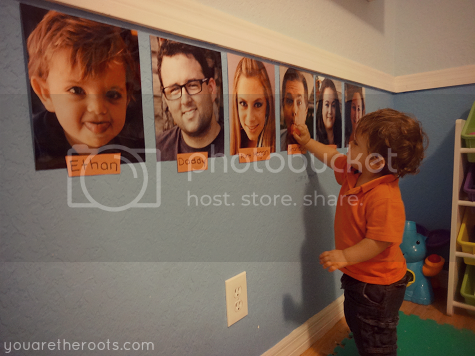 Unsightly tree aside, Ethan liked this activity a lot because he loves to look at family pictures. 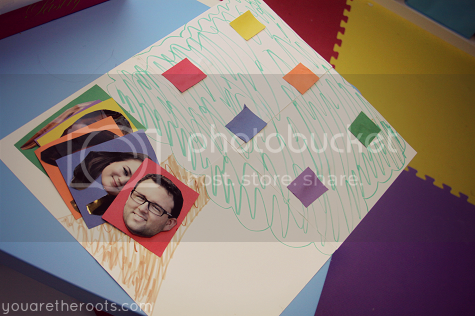 Each family picture was backed onto a colored piece of construction paper and there were corresponding colors attached to the tree. Ethan's job was to match each person to the corresponding color. He loved throwing them all up onto the tree at first and then clapping for himself. 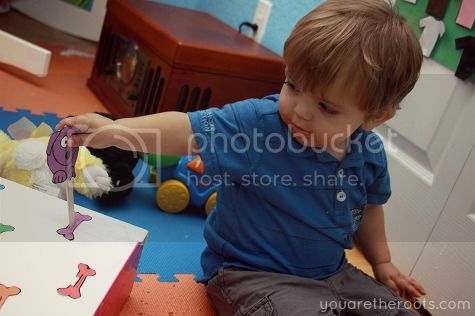 Once I pointed out the colors involved, he'd just sort of stick the pictures on any colored square -- but carefully to make sure each picture was on an actual colored square. 3. 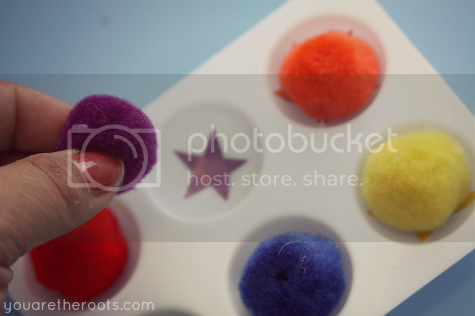 Color Matching Pom Pom Palette - I kept this one from last week, only modified it with star stickers on a square palette because the star stickers were closer to the shades of the pom-poms that I had. Ethan loved this activity and was great at matching the colors once I helped him compare them, but he still had trouble with red and orange. He then became extremely excited about shoving all the poms he could into one circle or trying to pile them up high. Towards the middle of the week, that was the way he liked to do this activity: seeing how high he could pile up the pom-poms. I knew it was time to retire this one this week! Ethan also became significantly more interested in the t-shirt matching activity and weather activity this week. Last week, he was pretty unimpressed by them. 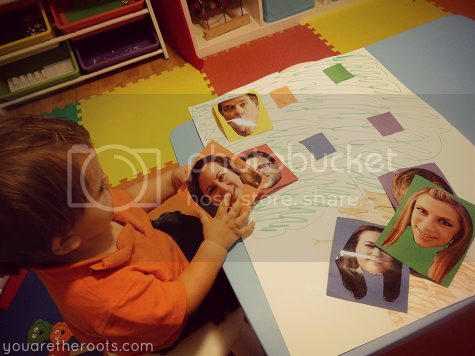 Also contrary to last week, Ethan was a lot less interested in the family portrait facial feature recognition activity. He still enjoyed it, but much preferred the tot trays this week. Like I said earlier, I encouraged Ethan to bring me any story that interested him from his bookshelf. Some we read once, others we read ad nauseum. 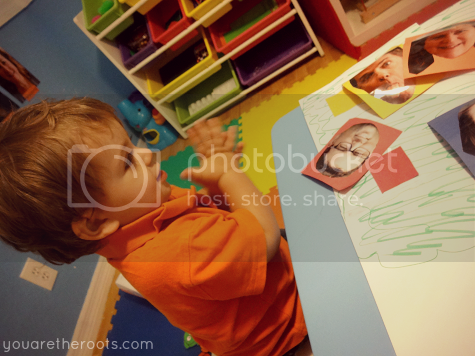 I LOVE seeing all that you are doing with him...it is inspiring and gives me ideas of more things to do with my two year old while my daughter is at school. Great post! Thanks so much! 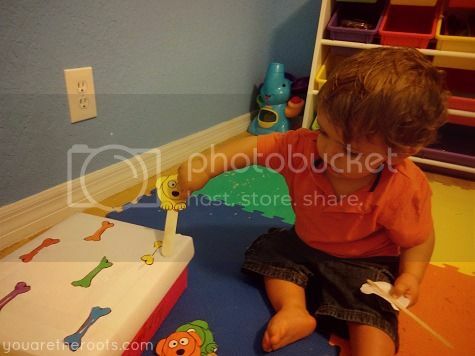 I'd love to see what ideas you come up with for your little one, too! I love brainstorming ideas with other moms. Wow this is great! You are doing such wonderful things with him. Something for me to keep in mind for the future. Thank you! 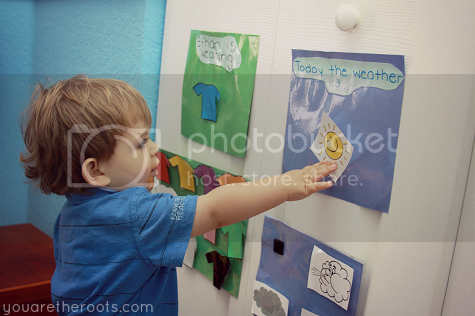 He's really, really getting into Tot School and that makes me happy! Of course, he's also a destructive toddler so our room doesn't look as nice as it once did when I first set it up -- ha! AWESOME ideas as usual! I can't wait to do these activities with Gage! I love that dog craft stick box! My LO is dog crazy. I totally found the same image on images.google and will be making this myself!